Science drives what we do at LASP. 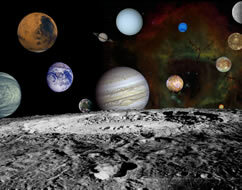 Our focus is on the solar system, including solar influences, atmospheric, planetary, and space physics in both experimental and theoretical areas. As part of a full-cycle institution dedicated to space exploration, many of our scientists not only perform research using remote sensing data—they also design the missions that take that data.